The Energy Bow is a totally unique guitar accessory. It's not just an effect like the many plug-in devices on the market. 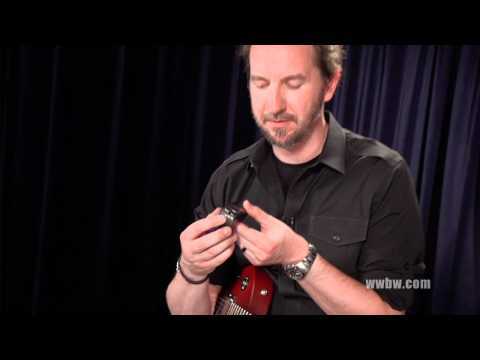 The EBow does its work on the string itself by producing an energy field that vibrates and sustains your guitar string... Direct String Synthesis . Infinite Sustain is just the beginning. Powered by a 9-volt battery, the EBow is held in place of your pick, giving you instant access to violin, cello, flute and horn sounds as well as unique sounds of its own. The EBow lets you play as fast as your left hand can scurry through a lick. Fade a string in from a motionless state for a reverse-tape effect. Run the EBow across the strings for gorgeous arpeggios. Add distortion for a screaming guitar sound. Playing the EBow directly over the pickup will increase your volume many fold and give you the crisp sound of super hot pickups. Moving away from the pickup gives you the mellow sound of a hollow body electric. The sounds you discover by experimenting with the EBow will amaze you. And like the best tools of the trade, the EBow will sound different for each musician. Welcome to the world of Direct String Synthesis. The principal is simple: a focused feedback loop directed at a single string. This produces a powerful, infinite sustain, rich in harmonics for incredible guitar sounds. It's like amplifier feedback with greater control and predictability, at any volume, even through headphones. This hand-held synthesizer provides an amazing variety of textures and tonal slurs - virtually an instrument in itself.